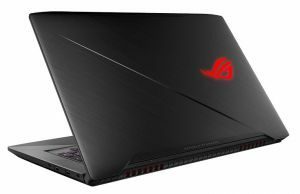 Back at IFA 2017 Asus announced an update for the mid-range ROG Strix gaming line: the GL503 and GL703 series. 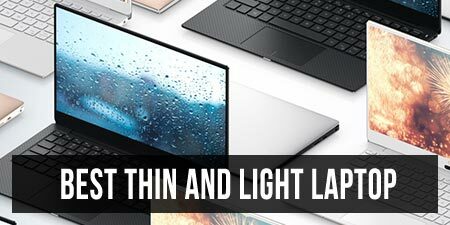 Given the previous GL502s and GL702s were some of the most popular laptops in their niche, the new generation attracts a lot of interest from potential buyers. Both the 15 (GL503) and 17 (GL703) inch lines are going to be available in a multitude of configurations, with the graphics chips inside as the main factor to set them apart. I’d expect most potential buyers to look at the 1060 models, as they’re capable of proper FHD gaming performance, and this table compares the specs of the GL503VD, VD and VS variants, so you’ll know what to expect from each of them. The 1060 GL503VM and GL703VM models are scheduled for October 2017 as far as I can tell for now, but the entry-level Nvidia 1050 GL503VD variant is already selling in some regions and as a result some reviews started popping online. 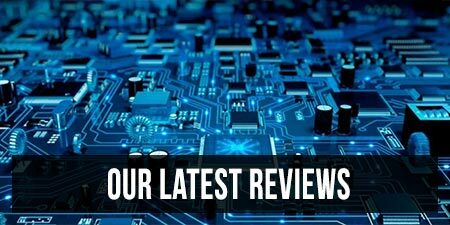 We haven’t got our own test unit for our standard review just yet, but we’ll gather in this article the impressions others have posted in their articles and videos, with our own comments and expectations, so you’ll know if the GL503VD is worthy of your attention and money or not. 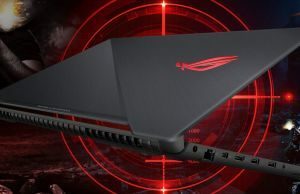 The Asus ROG Strix GL503VD is a mid-range multimedia and gaming laptop with a 15-inch matte screen, an RGB backlit keyboard and modern hardware specs, as listed below. 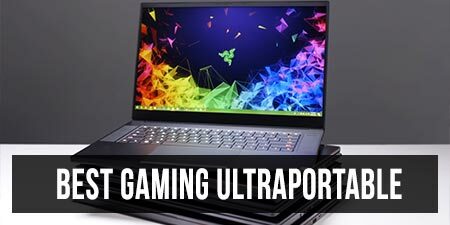 This is the configuration listed, available for sale and reviewed in this article and in the video below from Dave 2D, one of my favorite laptop reviewers on YouTube (check out his channel over here). 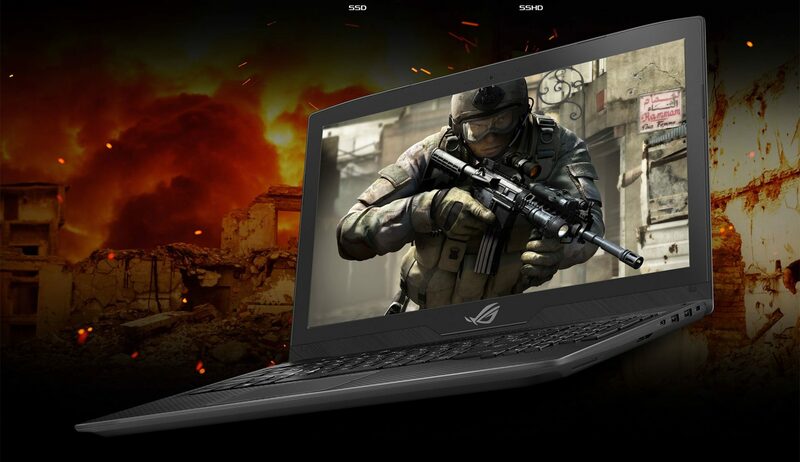 There’s no Nvidia 1050 configuration in the GL502 line, so the GL503VD is actually a closer follow-up for the ROG Strix GL503VD series that we talked about in this article and competes againts the other mid-range gaming laptops with Nvidia 1050 graphics chips. The GL503 takes certain design aspects from the flagship GX501 Zephyrus and as a result it thinner than the older generations, sturdier built, a little lighter and somewhat cleaner looking as well. Most laptop with similar hardware get a black and red/orange design theme, and the previous Strixes were not much different. The GL503 is cleaner though, with some red accents on the exhaust’s fins and WASD keys, but otherwise sober design lines. 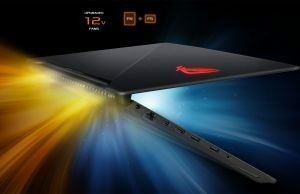 There’s still a big ROG logo on the lid though that can still kill this laptop for some professional environments, as it’s lit by the screen’s panel and cannot be stitched off in any way. Metal is used for the lid and the interior and the design of the lid is nearly identical to the GX501. The interior is simpler than on the older models, with fewer lines and more discrete branding elements. Dave mentions that the build is solid, with a strong lid and very little give in the main deck. The sides and back are still made out of plastic, and on the back there’s a service bay that allows easy access to the RAM and the two storage options (M.2 80 mm slot and 2.5″ bay). Taking the entire back panel apart in order to get to the cooling system or pehaps access the wireless chip on the other hand seems to be difficult, according to the reviewer. The keyboard is an improved version of the one on the GL553 series. It’s still a full-size model with a cramped NumPad section and narrow Arrow keys, but this time they’re better separated from the keys around, while the Power button is now no longer part of the keyboard. A nice addition is also a set of four multimedia keys at the top of the F1-F4 keys, they should be useful and they’re not in the way and shouldn’t be pressed by mistake when looking for other keys. I also noticed there’s a fan icon on the F5 key, which suggests a way to manually control the fans with FN+F5, giving this feature is available in the ROG app now. The keys are RGB backlit and you can customize the back-lighting on 4 different zones from the included Aura software app, much like on the GL553s. The keyboard itself should feel different than what we’ve seen on the GL553 though, as the keys are shorter (1.8 mm drop). Dave mentions the strokes are a little bit soft, but overall the keyboard is very nice to type on. The trackpad is made out of plastic, gets Microsoft Precision drivers and works alright, but both reviews mention very poor physical clicks, something to keep in mind if you’re the type who prefers clicks instead of taps. 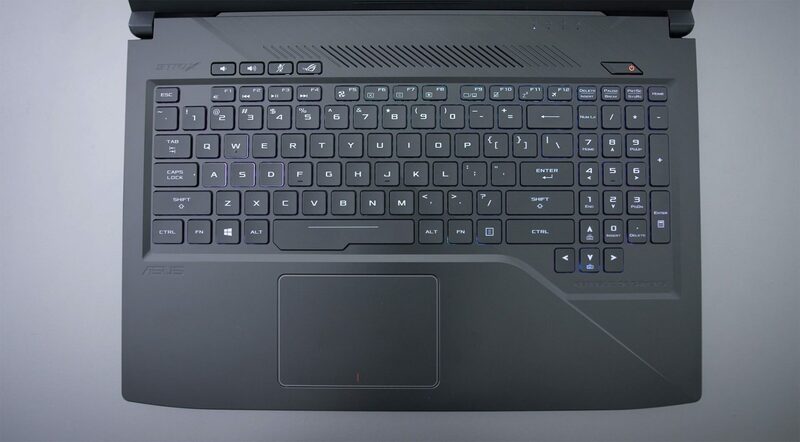 Design aside, the hardware on the GL503VD is very similar to what we could previously get on the GL553VD, with Core HQ Intel processor, the Nvidia GT 1050 graphics chip, two DDR4 RAM slots and two storage slots. 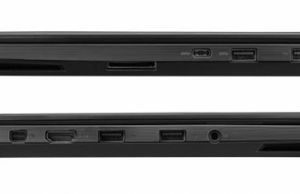 There’s no optical drive on this newer model though, which leaves extra room for a larger 64 Wh battery, which is one of the laptop’s main selling points in its niche where all other competitors, except for the Dell Inspiron Gaming, offer smaller batteries. 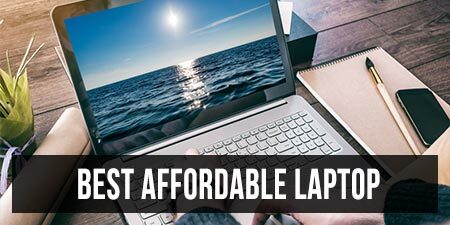 Both Dave and Laptopmag mention they were able to get around 3-4 hours of real-life use on their samples though, which seems a bit short to me given the configurations and battery size. The existing reviews speak highly about the screen as well, although the two sources don’t match up. Both got the FHD matte panel, but one claims 360 nits max brightness, while the other only measured 297 nits. That’s still better than you’d normally get in this segment and it’s corroborated with good contrast and bright, vivid colors. Unfortunately the existing reviews don’t cover some aspects well enough to answer a few important questions, but perhaps we can answer them in the comments section as time goes by. I’ll also try to update the article with new findings when available. First of all there’s the screen part. There’s no mention of it being an IPS panel, all the specs mention that it is a “Full HD Wideview Panel“. With that in mind and knowing that the entry-level GL553VD actually gets a TN panel (Asus calls it IPS-like, which is a better kind of TN screen, but TN nonetheless), I’d reckon the GL503 gets this same IPS-like screen as well. The existing articles praise the display though and don’t mention limited viewing angles or contrast/color shifting, both normally shortcomings of regular TN panels. So I’d reckon this kind of IPS-like screen should be good enough for daily use and given it’s in fact a TN panel, should also get better response times than the entry-level IPS options, something gamers would appreciate. 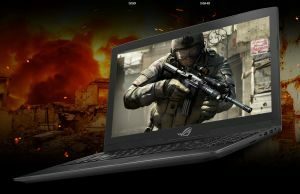 As a side note, Asus also lists the GL502VD with a 120 HZ TN screen option on their website, which is not available in stores yet though. It might be a nicer option for gamers, but I’d refrain from any conclusions until we get some details on brightness/contrast/colors. 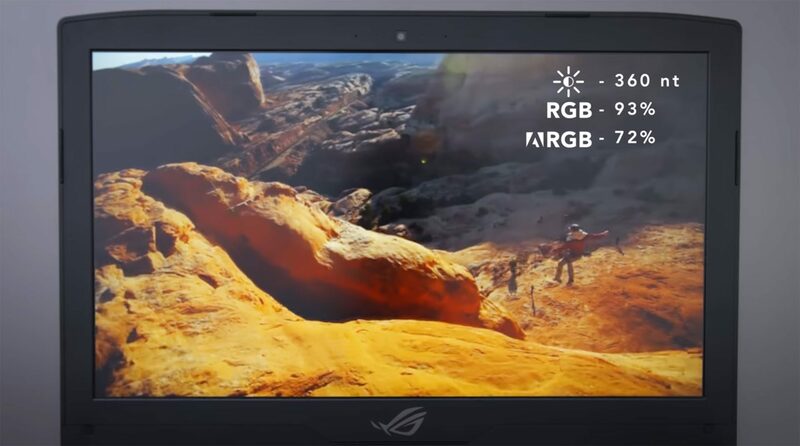 You should also keep in mind there’s no GSync on this laptop, so a 120 HZ screen on this GT 1050 configuration might not prove very useful in modern titles. Then there’s the performance. 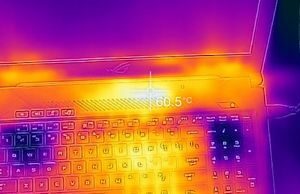 You know I like to take a very close look at speeds and temperatures, but there’s none of that in the existing reviews, which do however suggest that the laptop performs much as its expected from the configuration, without any noticeable hiccups. 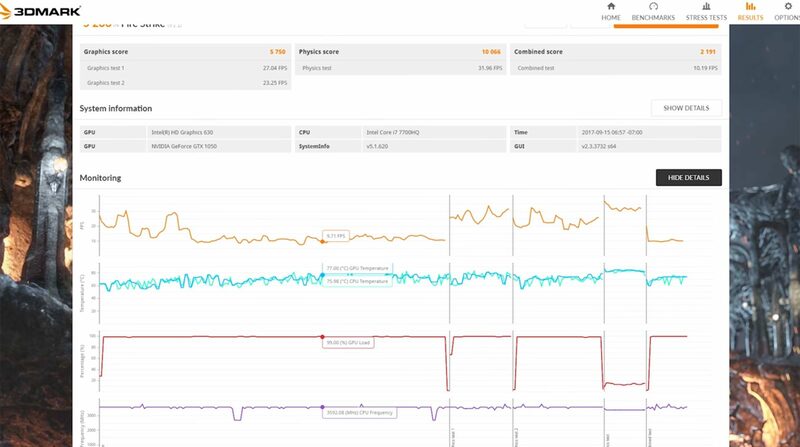 The pic below taken from Dave’s video shows that the CPU maintains constant speeds in 3DMark Firestrike, with temperatures averaging high 70s C for both the CPU and GPU. That’s pretty high, but I could live with them as long as there’s no performance loss. And don’t forget there’s always the possibility to further tweak them with undervolting and repasting. Then there’s the cooling. I couldn’t find any pic of the interior, but as far as I can tell from the pictures below, the cooling solution is very similar to the one of the GL502VM line, with two fans flanking the components and two heat-pipes shared by both the CPU and the GPU. It’s nice to see those large intake cuts on the underside though, paired with the intake cut on the inside, at the top of the keyboard, as well as the large exhaust grills on the back edge. However, these don’t seem to help very much on the GL503. 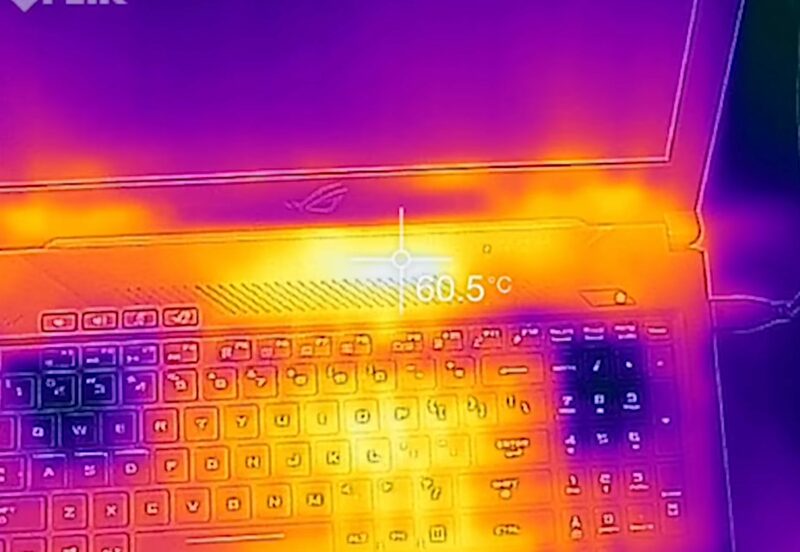 Dave’s video shows temperatures of up to 60 degrees Celsius on the interior and noise levels of 54 dB in front of the laptop while playing games, and based on that thermal images included below, while the hottest part is at the top, the middle of the laptop gets above 50s as well. 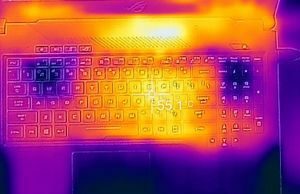 LaptopMag’s article mentions temperatures of only around 1o2 F(40 C) in the middle of the keyboard and 112 F(45 C) for the underside, but I wouldn’t’ trust their findings over Dave’s. 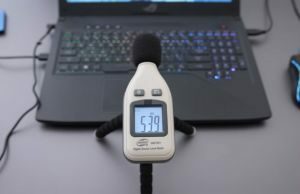 If these measurements prove to be correct and Dave didn’t somehow get a bad sample, the GL503VD runs both hotter and noisier than other GTX 1050 laptops. It’s true it is somewhat slimmer, but that’s not a trade off I’d be willing to take. 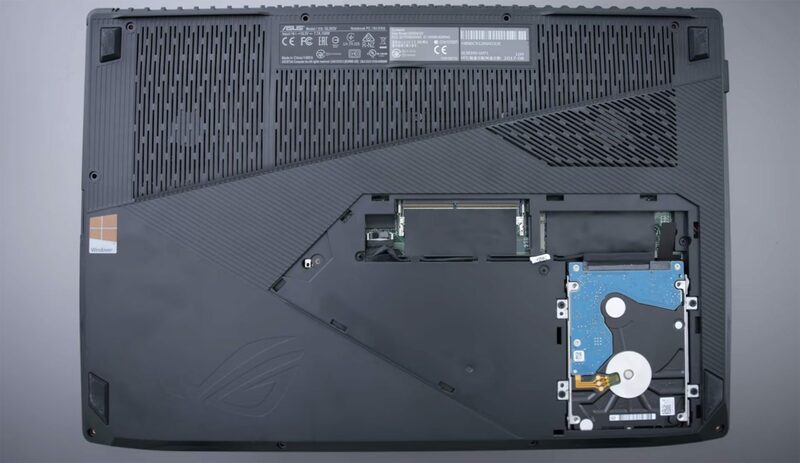 What worries me is the fact that Asus plans to put a GTX 1060 inside what looks like a very similar body on the GL503VM, but I’ve seen info that the 1060 models have been postponed in order for the engineers to design an improved cooling system with “3 separate heatpipes for the CPU and 2 separate heatpipes for the GPU” (source). Take this info with a grain of salt, but it makes sense for Asus to put a different cooling on the 1060s given what we’re seeing on this GL503VD and how the thicker GL502VM performed under load with the 2-fan/2-shared heatpipes design. One other aspect to mention here are the speakers. They’re placed on the sides and fire through some small grills, just like on the older GL502 and GL553 series. The reviewers mention they’re not very loud, but sound alright with everyday use, which is also the impression I’ve got when reviewing them on those previous generations. Laptopmag also mention some unnatural sounding “echoes” at louder volumes though, so all in all the speakers should be decent on this laptop, but not one of its main selling points. While we’re still waiting for further clarifications on the topics discussed above, there are some certain aspects that might steer potential users away. First of all, there’s the IO. While it’s not bad, it lacks certain modern features: there’s only an HDMI 1.4 port (which I’d reckon it means it is only hooked up to the Intel chip) and there’s also no Thunderbolt 3 support either. Hooking up a 4K 60 Hz port should still be possible through the existing miniDP connector, but even so, some of you might want the future-proofness of those newer connectors and they’re not going to get them here. There’s also no GSync on this laptop, unlike on the GL502VM. That means you get Optimus instead, so much better battery life with everyday activities, but at the same time gamers would have probably wanted GSync, especially on those 120 HZ panel options mentioned in the specs sheets. As far as we know for now Asus won’t put GSync on the GL503VMs either, but instead save it for the high-tier GL503VS models with GTX 1070 graphics and 144 HZ screens. We’ll see. 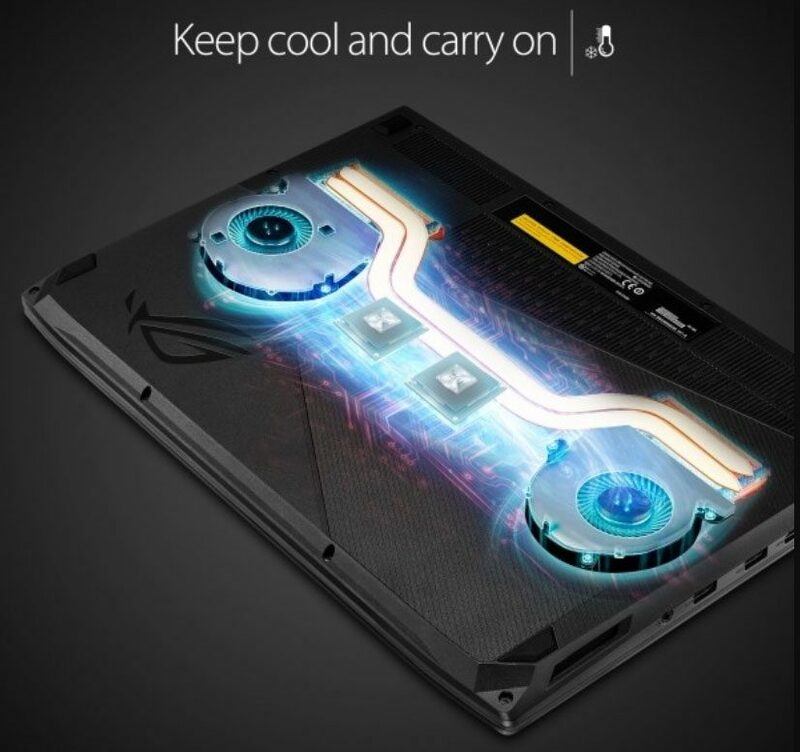 I for one could live with the issues above if this laptop were to perform well and run cooler and quieter than what we’ve seen in the existing reviews. Its pricing on the other hand is very hard to justify, and could be the main reason why you might look at the competition instead. We’ll talk about it in the next section. 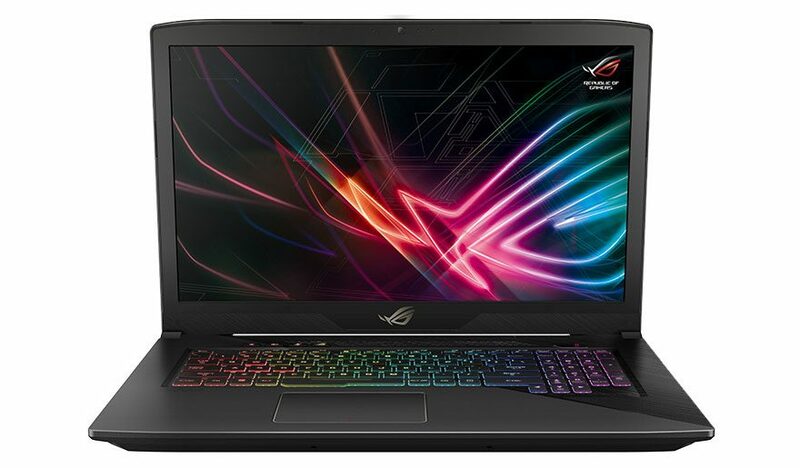 As of late September 2017 the Asus ROG Strix GL503VD is available for $1099 in the US , for a Core i7-7700HQ configuration with the FHD screen, Nvidia 1050 4GB graphics, 16 GB of RAM and a 1 TB SSHD. Across the pond you can find a Core i5-7300HQ model with the same screen, graphics and storage, but only 8 GB of RAM, for around 1050 EUR. Acer Predator Helios 300 – review – i7 / 1060 / 256 GB SSD configurations start at $1100 (5.7 lbs, average IPS screen, 48 Wh battery). There’s a longer list of 1050/1050 Ti alternatives in here, as well as a selection of laptops with more powerful GTX 1060 graphics over here. 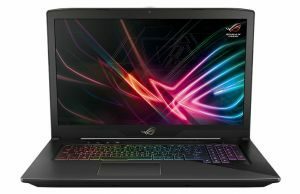 The Asus ROG Strix GL503VD is a very hard sell at the existent prices. 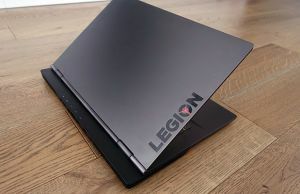 On one hand it is nicer built and cleaner looking than other laptops with similar traits, and from what we know so far it also gets a better screen, a comfortable RGB keyboard and pretty big battery that should give it an edge over most alternatives. Performance in demanding loads on the other hand is something we should further look into, as well as the thermal and acoustic behavior in those crunching scenarios and in games. 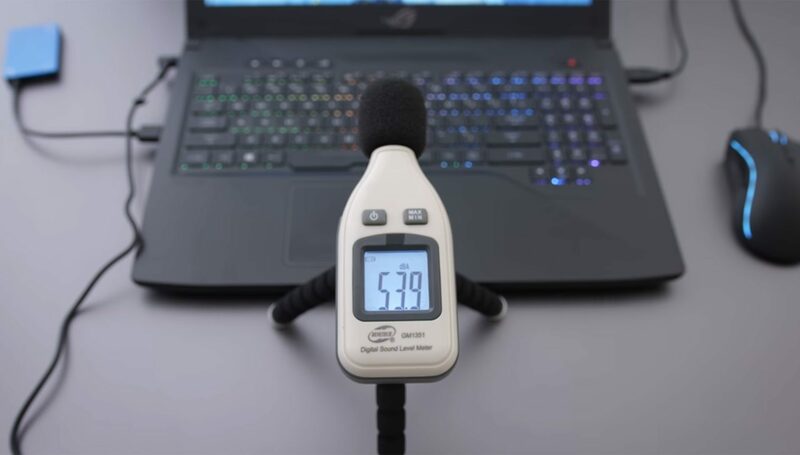 Based on the two existing reviews, those might could be a problem, as 50+ Celsius at keyboard level and 50+ dB fan noise with games would probably steer me towards something else. I appreciate what the laptop has on its side, but not enough to justify accepting those. Then there’s the price. 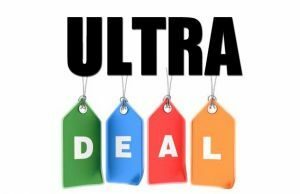 The GL503VD is expensive for what it is and those looking for the best performance for their money will find better value on devices like the Acer Aspire VX15, Acer Nitro 5, Lenovo Legion Y520 and even the Dell Inspiron Gaming 7567 (mostly if you’re living in the US). With the Asus ROG you’re asked to pay a lot extra for its nicer traits, but I’d expect to get flawless performance and a very enjoyable everyday experience in return if I were willing to do it, which doesn’t seem to be the case with those temperatures and noise. 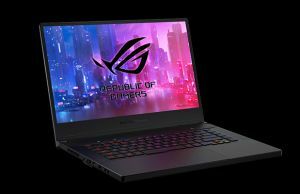 The older ROG GL553VD is also more expensive than the competition while offering a nice screen, an optical drive and a much cooler/quieter cooling system, and people are willing to pay the extra for them. Are they going to do the same for the GL503VD? Well, we’ll see. I’ll save my final conclusions for my actual review that would allow me to better address those aspects mentioned in the “Still confused” section of this article, but in the meantime that’s how I feel about the Asus ROG Stix GL503VD based on the existing reviews. Feel free to get in touch in the comments section if you feel otherwise, if you have any feedback or any questions about this laptop and others in its segment. it should cost more, but it will get better graphics. I find this a bit expensive for a 1050 config, even with the nicer built and screen. Up to you though. Hitachi owns the IPS patent which is licensed to Philips-LG, so no other screen can be legally called an IPS panel besides those from LG. Other manufacturers like AUO, Samsung, BOE…, have similar technologies (AHVA, PLS, ADS) for getting the same results (or even better sometimes, depending on the screen model) to IPS panels from LG. Now, if you were referring to the NV156FHM-N43 panel (which uses BOE's ADS technology) used in the GL553 series, then it definitely belongs to the IPS family (not TN). 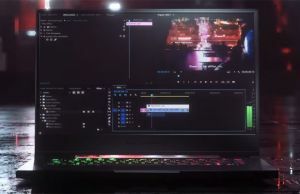 The 17 inch screen from the GL703vm (from Dave's YT review, most probably is the chi mei N173HHE-G32, which is basically a high gamut TN panel with improved viewing angles (TN UWVA), which some laptop ODM's call it "IPS level". You can clearly see the difference between the viewing angles from the chi mei TN UWVA vs boe's ads type, by comparing the images in the "viewing angles" section from the reviewed laptop models that are equipped with those screen models. Which one is better gl503vd vs. gl502vm considering the build quality , heat dissipation, fan noise and sound quality ? Tough call. I'd probably go with the 503VD because it's a newer design, but the speakers and cooling are similar as far as I remember. There's a common problem with ASUS GL503VD, where keyboard suddenly just stopped working. The only button working is the power button. To temporarily fix the problem, you have to press the power button to switch to sleep mode, then press power button again to wake. That way, keyboard will start to work again. The same problem exist on other models but they we're fixed on a BIOS update. Currently, GL503VD doesn't have a fix for this problem, no new BIOS update. The same problem are posted again and again on ASUS Laptop Philippines Community on Facebook. ASUS warranty? It's not that easy. It doesn't happen all the time. It's hard to troubleshoot. When you bring the laptop to ASUS Service Center, it's as good as no damage as it doesn't happen all the time. It just randomly disabled keyboard, whether you are in a middle on playing an online game, typing a document or watching a movie. Very annoying problem if you asked me, an ASUS GL503VD user. To be honest, I regret buying this specific model. I've seen other users posting on Facebook the same problem but I thought it was just a coincidence on their purchase. Now, I'm having the same keyboard problem as others does, with the same GL503VD laptop. same issue with me do you have any botom screen defects i sure do and also i have i friction noise on what i believe is my cpu's fan is that a common occurence? if so how could i fix it? I have the Gl553vd with he Geforce 1050ti…. so is the Gl703vm with the GeForce 1060 that much better is it worth upgradin to?? 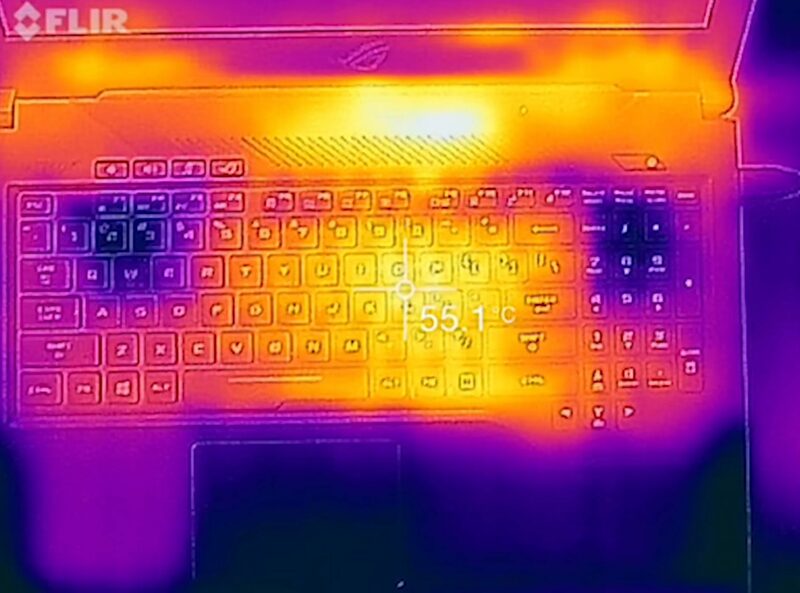 Also is it normal for my pc to got between 80 and 90 degrees celcius if i'm playing cs-go or any game for that matter. How is the battery life of asus gl503ge?? How long it can last in all different scenarios?? Is is suitable for college and everyday work. 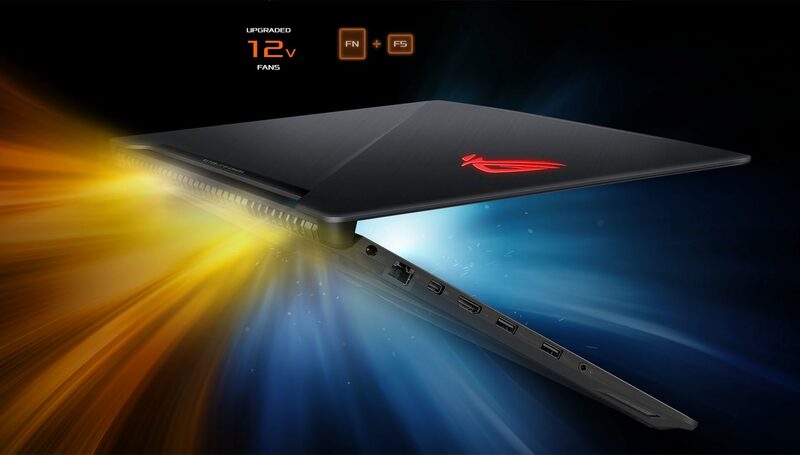 Can i buy Asus rog strix edition Gl503GE-EN038T… core i7 and 8 generation. What are the problems with this laptop? Please help me? I want it for gaming and programming work.